Situated 108'37"-117'50" east longitude and 3'58"-20'20" north latitude, Hainan Province, at the southernmost tip of China, is separated from Guangdong Province on the mainland by the Qiongzhou Straits. Established as a province in April 1988, Hainan covers an area of 34,000 square kilometers, including the Hainan Island and the Xisha, Nansha, and Zhongsha islands and their surrounding territorial waters. Hainan enjoys a tropical monsoon climate and is frost-free all year round. It has a mean annual temperature of 22.5oC-26oC, and a mean annual precipitation of 1,500-2,600 mm. It is frequently visited by typhoons throughout the year. It is divided into 2 prefecture-level cities, 7 county-level cities, 4 counties and 6 autonomous counties, with a population of 7.87 million by 2000, mainly including ethnic groups of Han, Li, Hui, Miao and Zhuang. Nowadays, Hainan cuisine is very popular all over the world, especially the fresh and delicious seafood. What particularly attracts tourists, both domestic and foreign, to Hainan is its characteristic beauty of south China with sunshine, beaches, seawater and hot springs. As a result if recent efforts, Hainan has completed and put into use a series of holiday resorts with high-level hotels, becoming a fabulous competitor in the tourist market of East Asia. Leading festivals are the Hainan International Festival of Coconuts and Third Day of Third Lunar Month Festival. About 6,000 years ago, there were ancient people living in present Hainan area. Hainan first entered written history in 110BC, when the Han Dynasty (206BC-220AD) established a garrison there. In the Yuan dynasty (1271-1368) it became an independent province, but was placed under Guangdong Province in 1370 during the Ming Dynasty (1368-1644). Hainan Province, also called Qiong, is located in the southernmost part of China. The Hainan Island is like a circle island. From the center spread outward, the rugged hills, plains and sea were linked one after another. Zengmu'ansha is the hottest place in the southwest. 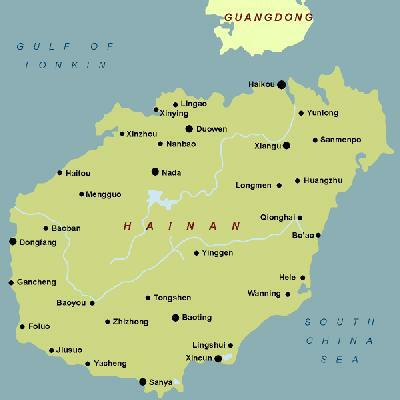 Established in 1988, Hainan Province is the largest special economic zone and the youngest province in China. It abounds in minerals and resources of animals and plants, especially its rich petroleum and natural gas. With the high speed of economic development, it becomes the key production base of tropical products in China, including sugar cane, peanuts, coco, coffee, sisal, pineapple, seafood, precious timber and plastic, etc. The Hainan Island has a coastal line of 1,580 kilometers, and it enjoys a tropical monsoon climate and is frost-free all year round. The climate is warm all year round with sunshine most of the times. The forest area covers more than 50% of the total island. Its natural beauty has gained a good reputation among the visitors and has been widely known around the world. People call it "the Oriental Hawaii". With blue clear sea and fresh air, the island is covered with beautiful tropical plants. There are many famous places to visit, such as the Wugong Temple (the Five Officials Memorial Temple), the scenic spot of Tianya Haijiao (the Remotest End of the Earth and Corner of the Ocean), the Dadong River and the Yalong Bay in Sanya City. Hainan is a multinational region, and there the ethnic villages of Li and Miao are very typical. The hospitable villagers will treat you with traditional food as well as wonderful singing and dancing performances. So the Li and Miao Villages in Hainan are well worth a visit.